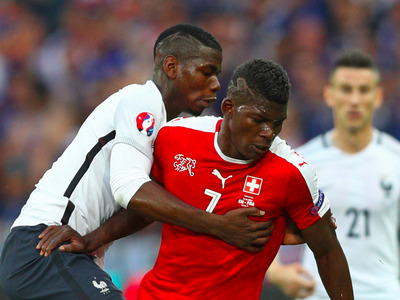 Paul Gilham / Getty ImagesBreel Embolo (Middle) was one of many Swiss players who ripped their shirts. At least three Switzerland players managed to rip their shirts in their game against France in the Euro 2016 Championships on Sunday. Granit Xhaka had to change his shirt twice when both were ripped during scuffles. Midfielder Admir Mehmedi also had to collect a new shirt in the first half while striker Breel Embolo endured a tear not long afterwards. As if to add insult to injury, the ball burst when Switzerland midfielder Valon Behram went in to tackle French striker Antoine Griezmann. Swiss team’s Puma shirts tearing like paper. Adidas ball bursting. You can never rely on German efficiency! Despite such a scrappy game, the goalless draw was good enough for both teams to progress beyond the group stages into the last 16, with France topping Group A and Switzerland coming second. Puma, the makers of the shirt, could not be reached for comment. Meanwhile, England plays Slovakia tonight at 20:00 GMT in its final group game. A win or a draw will be good enough to ensure it qualifies to the knockout stages.